Cytokines have an important role in the inflammatory reaction and development of infection by respiratory microorganisms. 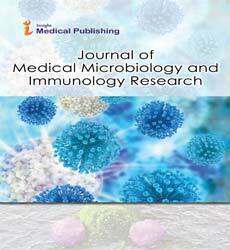 In order to identify the density and distribution of different inflammatory cells in lamb lungs affected with Pasteurella multocida, Mannheimia haemolytica, Mycoplasma ovipneumoniae and Mycoplasma arginini under natural conditions, microbiological and immunohistochemical techniques were used. The experiment was conducted with forty fattening lambs from five feedlots in Extremadura (Southwestern Spain). The results showed an elevated count of labeled cells with a proinflammatory cytokine (TNF-α) in bronchial area, whereas, in alveolar area the anti-inflammatory cytokine, IL-10, presented the highest level of labelled cells. These observations suggested the chronologic order of these respiratory microorganisms in lungs according the different localization in lung tissues of the labelled cells. Different inflammatory response and possibly pathogenicity is also suggested, being M. haemolytica, which produced the most response of cytokines and M. arginini the lowest one.